As a follow-on from the last article (Your ‘A to B’ for 2013 – Dec 2012) about consciously setting personal goals to move yourself from A (where you are now) to B (your Goal), this article is about the influence of sub-conscious goals. New Year Resolutions? What’s the Point? However clear or unclear your intentions for your year, however high priority or non-existent, as soon as you ask yourself these questions, there will be an inner feeling of moving forward in your life towards something known or unknown, something to be feared or embraced. This is your awareness of your sub-conscious goals or expectations and this feeling from ‘outside your box’ will influence your conscious decisions and your life whether you are aware of it or not. 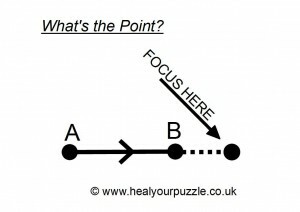 Asking “What’s the Point?” starts your process of connecting with your Higher Personal Goals – your life’s ‘bigger picture’. If you are challenged in your life in any way by work, your career, health, relationships, money, by repeated or continuous difficult patterns of behaviour or events, especially if over a number of years, it is likely that your sub-conscious goals are not in alignment with your Higher Personal Goals; you are not seeing ‘The Point’. Another way of realising this is that you are not even able to set a goal B or that ‘B’ is never reached, or you get there and realise it is not enough or feels wrong. Of course you can set further goals C…D… but wouldn’t you rather ‘get to the Point’ quickly? Getting to the ‘Point’ The ‘Point’ refers to the alignment of your conscious intentions with your Higher Personal Goals and because of the subtle nature of this it requires some ‘thinking time’ when you ask Yourself and your Higher Self ‘Come on, really, What is the Point?’ Spend some quiet time daily asking this question and observe what inspiration or opportunities come your way. You may be drawn to a workshop, meditation class, art work, dance class or just an informal chat with a friend. Your ‘Point’ may spontaneously appear in your Mind or it may come into focus one step at a time. Find your bigger picture and live your life as intended. Wishing you all much joy in 2013.